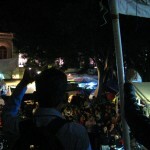 All photos by Shannon Young. 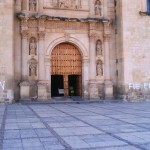 Hear and read the accompanying report, Mexican president leaves country as news of apparent massacre deepens political crisis. 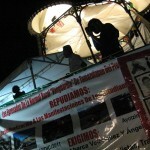 Kiosk in Oaxaca City’s main plaza during night time rally, November 7, 2014. 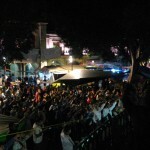 The view from behind the speakers’ platform during a night march in Oaxaca City, November 7, 2014. 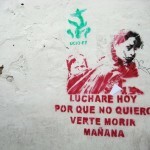 Teachers in Oaxaca raise their fists and sing. 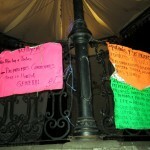 Signs opposing the president’s reform agenda. 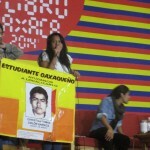 Relatives of missing student, Christian Colón Garnica took over the main stage of Oaxacaś International Book Fair to host a three hour open mic session with the public on November 7, 2014. 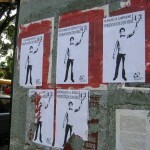 Wheatpasted posters in solidarity with the students form layers in the streets of Oaxaca City. 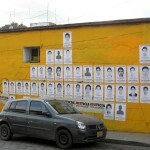 The faces of 43 missing students adorn the walls of an art workshop in Oaxaca City. 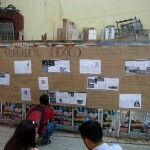 University students assembled a “newspaper mural” for passers by. 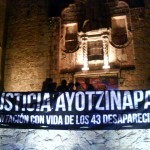 A banner calling for justice for the Ayotzinapa students made an appearance at an open air concert in Oaxaca, November 8, 2014.